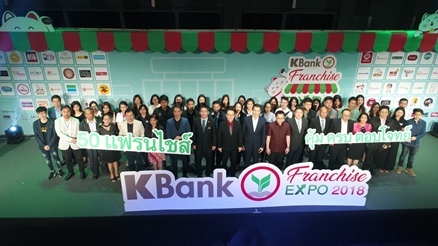 Mr. Surat Leelataviwat (center), KBank Executive Vice President, teams up business partners and 50 leading franchises to organize the KBank Franchise Expo 2018 under the “Value for Money and Completeness with Full Solutions for Franchises” concept. Aside from franchise loans at a special rate, the exhibition will feature booths offering premises for immediate rent and seminars providing business knowledge and advisory services by leading gurus, aimed at supporting those interested in investing and expanding franchise businesses. The KBank Franchise Expo 2018 will be held, February 9-10, 2018, 10.00 hrs – 20.00 hrs, at 5th Floor, BCC Hall, Central Plaza Ladprao.